31 BSc. Business Information Systems graduates are the first in their Degree Programme to achieve an IIBA Academic Certificate in Business Analysis. At UCC’s Autumn Conferring 2017, 31 BSc. 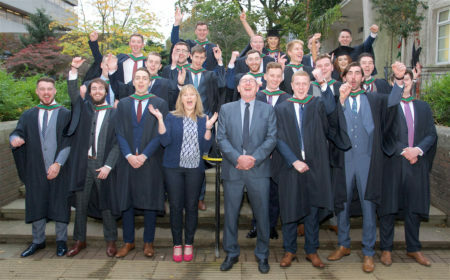 Business Information Systems (BIS) graduates from Cork University Business School (CUBS) at UCC were the first to achieve an additional qualification as part of their Degree programme, and were awarded the IIBA Academic Certificate in Business Analysis. Established in 2003, International Institute of Business Analysis (IIBA) is the leading association for business analysis around the globe, and the IIBA Academic Certificate in Business Analysis gives anyone considering a career in business analysis the ability to gain a comprehensive understanding of business analysis fundamentals while earning a business analysis certificate. As an academic member of IIBA for the past three years, BIS identified an opportunity to provide undergraduate students with an additional, industry recognised qualification, and pursued accreditation with IIBA in 2016 for its undergraduate BSc. BIS programme. After IIBA completed the assessment process, BIS received recognition for its academic credential. Pictured are BSc. Business Information Systems (BIS) graduates from Cork University Business School (CUBS) at UCC were the first to achieve an additional qualification as part of their Degree programme, and were awarded the IIBA Academic Certificate in Business Analysis at the Conferring Ceremony on Wednesday, October 18th. Participating students were required to undertake two elective modules in the final year of the four-year degree in UCC. As part of these modules students studied the ‘Guide to Business Analysis Body of Knowledge’ which is the essential standard for business analysis practitioners. Students who achieved 2H1 or higher in both modules were awarded the IIBA Academic Certificate in Business Analysis and will now be listed in the IIBA certificate registry found on iiba.org. Ahead of the BSc. Business Information Systems Conferring, the 31 IIBA graduands and their classmates, including families, attended the annual BIS Graduation Breakfast which recognises the hard work and achievements of the graduands over the course of their college career. Anyone interested in learning more about BIS (Course code: CK203) in UCC can find out more at www.cubsucc.com.